The YoTricks.com app has been in the app store for one day and we are quite pleased with the results. So far we have had more downloads than expected, and a full third of those downloads have come from users outside the United States. 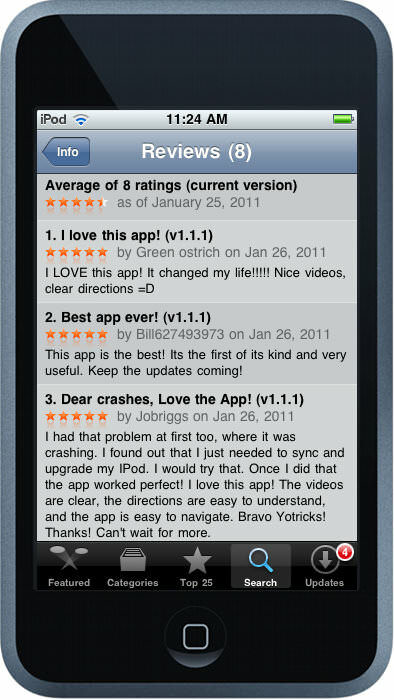 The reviews in the app store have been positive overall, as you can see from this screen shot taken on my iPod Touch. Whoever Green Ostrich is, that person really seems to like the app. Said it changed their life . Glad we could be of assistance. Thanks to everyone who has downloaded the app so far and has been helping us spread the word. If you have not logged on to review the app yet please do so as this will help us gain ranking in the app store. If you have any comments about the app feel free to make them here. We are aware that some users are experiencing crashes. This has been remedied in every case we have become aware of by updating the iOS software on the device. Let us know your experiences in the comments, as well as any additions that you think might make the app better. Thanks!